Retailer or not, this stock is ready to run. Macy's (NYSE:M) is on the move. The 200-year-old retailer's stock is up 25% over the last three months, trouncing the market by 15 percentage points. And management is optimistic enough that it just boosted both Macy's dividend payout and its share buyback plans. I think investors should be (cautiously) optimistic here too. Macy's remains one of the best values in the retailing space, even after the stock's recent bounce. The department store's latest results show why. Sure, they didn't knock the lights out. But business trends kept up their impressive streak of outperformance. Macy's grew comparable sales by 3.8% despite the cold weather that pinched most retailers. Kohl's (NYSE:KSS) sales, for example, fell by 1.9% over the same period. And Nordstrom (NYSE:JWN) only managed a 2.7% rise. Macy's also bested those two stores in earnings quality. The company's EBITDA margin for the last 12 months hit 14.8%, which was better than the 13.4% it logged last year, and much higher than 2011's 12.3%. A successful multichannel sales strategy has been driving those gains. After pouring resources into stores so that they can act as fulfillment centers for online orders, the bet is starting to pay off. Macy's now claims 300 locations pulling double duty like that, up from just 23 at the start of last year. That can boost sales by making for faster and cheaper delivery to nearby customers. And it increases efficiency by keeping the back of the house humming even when things like the weather depress customer traffic levels in the store. But it's still traditional retail sales that matter most for Macy's. And the company's years-long effort to localize its product offerings has helped it stay relevant to consumers as their fashion preferences change. In just one example of that process at work, CFO Karen Hoguet told investors last month that Macy's was able to increase coat sales by 30% in the Boston market by freeing its buyers to change the playbook from what was selling well in New York. An investment in Macy's has its share of risks, though. For one, the company isn't immune to the tough retailing trends that have hurt competitors. Last quarter it saw weakness at both the high and the low end of its customer base. Budget shoppers and Bloomingdales fans alike dialed back their spending. And, while Macy's has been executing well over the last few years, there's no doubt that it has gotten an assist from J.C. Penney's (NYSE:JCP) implosion. That struggling retailer has released billions of dollars in sales revenue back into the market, including over $500 million last quarter alone. While Macy's and others have been happy to take those customers on for themselves, that kind of market share tailwind won't continue forever. Still, I think Macy's will perform even after J.C. Penney stops giving it an unintentional lift. And while shares aren't exactly cheap, they're a good bargain. Macy's is trading at just 11 times next year's expected earnings. That compares well to Nordstrom's forward P/E of 14, and Kohl's 11. And when it comes to income, Macy's yield is a shade above 2%, which is less than peers'. 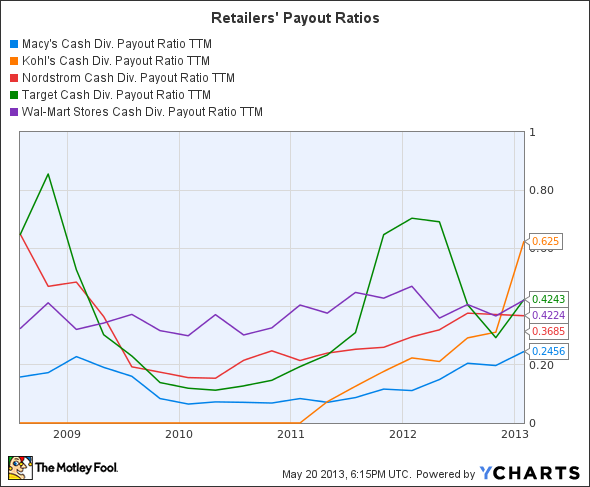 But its payout ratio is the lowest among major retailers. M Cash Div. Payout Ratio TTM data by YCharts. Combine that low payout with industry-leading sales growth, and Macy's dividend -- just like the stock -- looks like it has plenty of room for growth ahead.